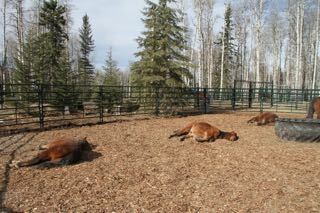 Here three of our most recent rescues stretch out to rest in the warm sunshine. All of our rescues are adapting well to their temporary home as the gentling process continues. This pen will be the last ones to be haltered and then gentled. 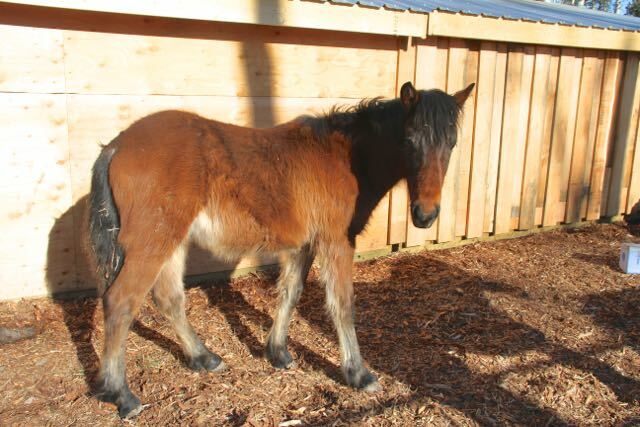 As in the last blog we have one of the mares in this pen, who is getting close to term with the foal she is carrying. She will be with us until her foal is old enough to be transported safely without stress and they will go as a family when it is time. 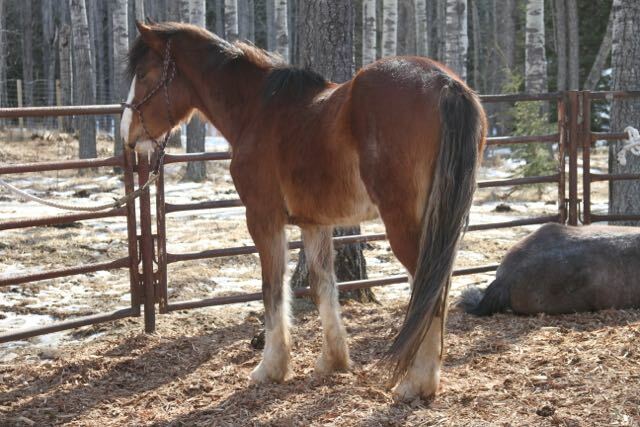 Upon examining the horses more closely we find that she is not the only mare that is in her pen that is carrying a foal. 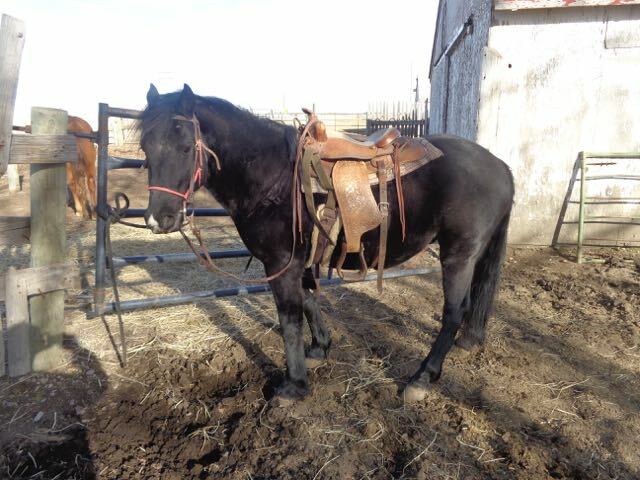 It was a surprise to find the young 3 year old mare (A20) is showing signs now. This beautiful sweet mare is very friendly and curious of us whenever we work around them cleaning the pen or doing the feeding. She definitely is not as far along as Wild Ghost Bay, but her baby tummy is starting to show. So she will be with us for a while also. 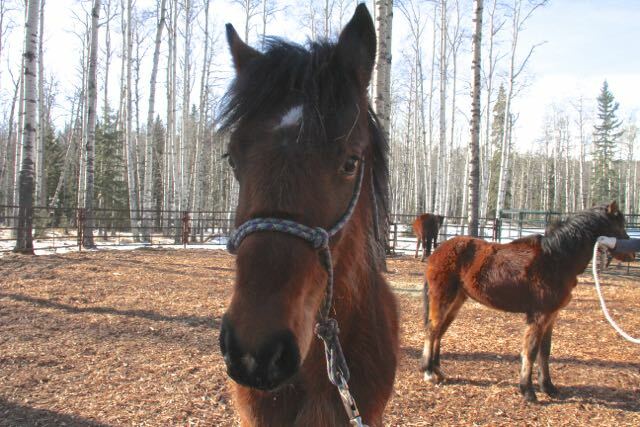 Then she and foal will be adopted as a family unit. Here two of the young fillies, “Missy” and “Lilly”, are prepared to be loaded and go to their new home where they will grow up together. I am sure that they will be given new names when they get to their forever home. It was a pleasant surprise as Missy hesitated just a few seconds before she jumped in the trailer and then Lilly just jumped in without hesitation. I received an email indicating they had arrived home safe and sound and were enjoying their new surroundings. 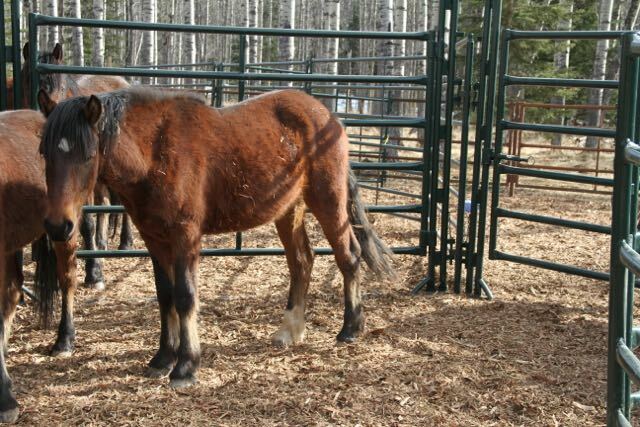 One of young horses that was adopted this weekend is Apollo. It has been fun as Greg and Jack have come up these names to help identify them when they are working with them. This little one was given the name Percy and is now adopted. This beautiful young stud has also been spoken for. Curly as he was named is doing well, but like some of the older wildies maintains his dignity and is a little aloof from our human touch. When you go into his pen to clean though he follows you around making sure you are doing it right. Perhaps our biggest adoptee, Patches, is a beautiful young boy who is still looking for a new home. He is unique in his appearance and when he looks at you he has such a beautiful soft and curious eyes. As more and more people come to visit to learn about our facility and what we are doing for the wild horses, they also fall in love with them and become a voice for them. 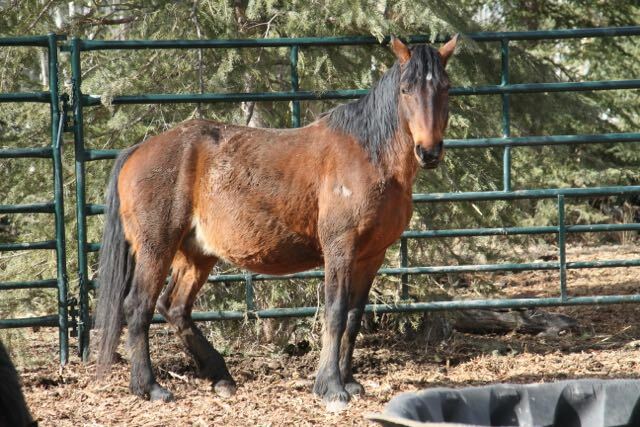 We also continue to receive applications for adoptions and make arrangements to visit to pick out a wild horse that will be theirs in a new forever home. 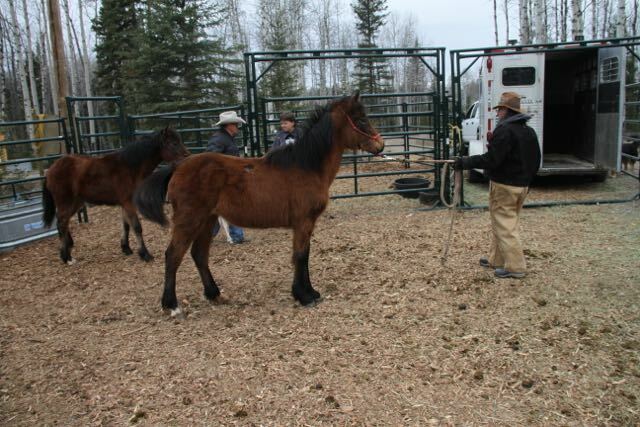 Our gentling of the wild horses is moving along well and we now have halters on all but 6 of the horses we are working with to allow them to go to good homes. Some are easier than others, but with the gaining of their trust they all come around and accept us and what we are trying to do for them. Of course the two mares in foal will have to wait quite a while before they are haltered to lessen any stress on them. We wanted to include this picture of a young boy that was rescued by WHOAS and a member last year. 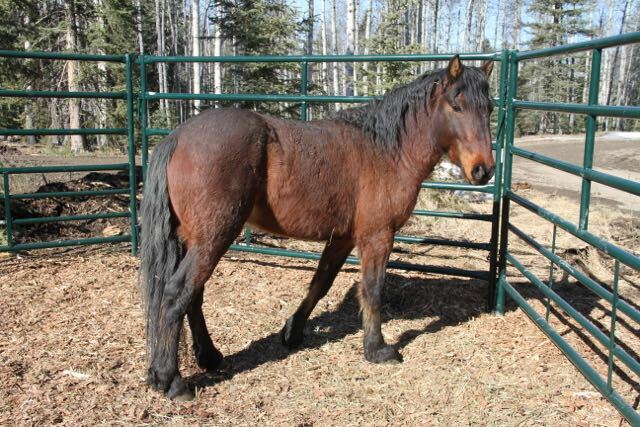 He was taken to his new home in southern Alberta where he was gentled and has now begun his training for becoming a saddle horse. This shows that these beautiful horses with caring love and patience can become a suitable partner for whoever does adopt one. We continue to welcome interested applicants to submit a request to adopt and we will email the application forms. 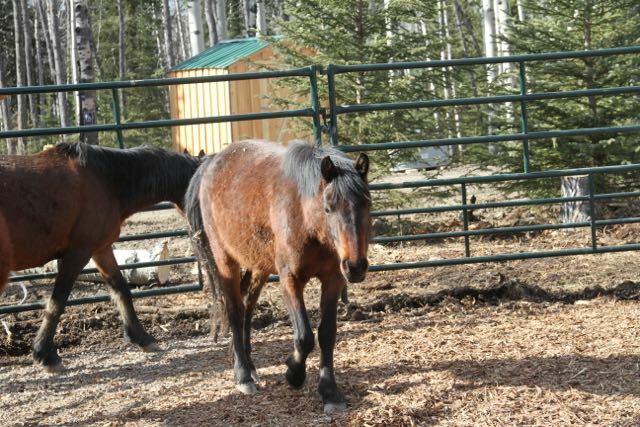 The most important thing we want for all these horses is that they go to good forever homes.